morning and afternoon/night game drives. walk/drive combination, soft drinks, house wine and local beers. On arrival at Rhino Post Safari Lodge you will be greeted with a refreshing drink and given a brief introduction to the lodge after which you will be shown to your room. After settling into your suite, you are invited down to the lounge, overlooking the water hole to enjoy a scrumptious high tea before departing for an afternoon/evening game drive. Game-drive safaris at Rhino Post Safari Lodge are conducted in specially adapted open 4×4 Land Cruisers, with professional guides. In addition to our private wilderness concession, we make use of the Kruger public roads and also have exclusive use of some of the Kruger Park public roads at night. Rhino Walking Safaris are allowed to utilise certain public roads for night / evening drives well after gate closing times. At sunset the game drive will stop for drinks while watching an African sunset before continuing into the night, spotting nocturnal animals. Returning to the lodge in time to freshen up, enjoy a drink before dinner on the deck as you recount the day’s events, all the while accompanied by the night sounds of the bush. After enjoying your final morning game drive at Rhino Post and a delicious brunch, the lodge will transfer guests through to Plains Camp in an open 4×4 game vehicle. Plains Camp is situated in the heart of the wilderness concession overlooking the spectacular Timbitene Plain and waterhole. Built in authentic pioneer tradition, it has the serenity of a 19th century naturalists rest, nestled in an Acacia Knobthorn thicket. Plains Camp has 4 comfortably furnished African explorer style tents, en suite with hot running water and the African Wilderness right on your doorstep. The concession is an environmentally sensitive area previously unexplored, with a huge diversity of both fauna and flora – an ideal setting for wilderness walking safaris in an internationally renowned ‘Big 5′ game area. After settling into your tent and exploring the camp, high tea is served followed by a brief on the ‘do’s and don’ts’ of bush walking by your guide. 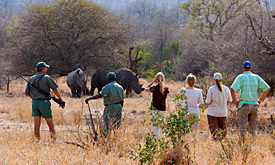 Rhino Walking Safari guides meet the stringent requirements of the South African National Parks and senior guides hold the highest guiding qualification possible in South Africa. After the brief, you will depart with your 2 armed guides for an introductory walk, returning to the vehicle in time for sundowners and enjoying a short night drive before returning to camp. After an early morning wake-up, fresh coffee, tea and rusks (a South African tradition! 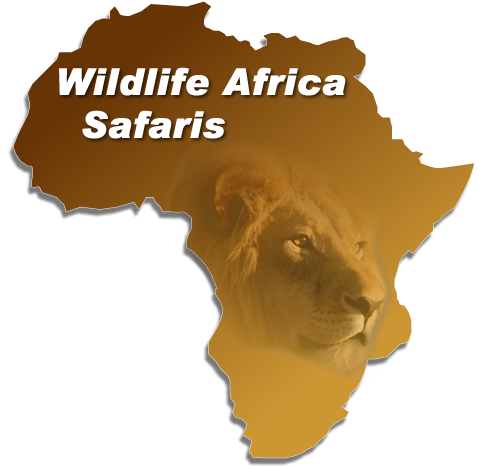 ), everybody departs with the guides for the next safari walk. Nothing is predictable in the bush; therefore each safari offers a potentially new experience. Our guides will share their wealth of bush experience which involves the identication of animals, trees, grasses, insects and birds. The medicinal uses of plants, local folk lore and basic tracking and survival skills are also discussed. All walking trails are enjoyed in the early morning and late afternoon to avoid the midday heat, with the average duration of the morning walk being between 3 and 4 hours. The Guide will structure the walk taking into account the fitness level of the group and any special requests. After a light snack on the walk, you will be served a well deserved brunch on your return to the camp. Relax during the heat of the day, enjoying our small Africana book collection or the plunge pool overlooking the plain, which is often host to zebra, buffalo, giraffe, elephant, rhino and lion. The afternoon safari activity is a short drive in the game vehicle to a specific location, after which you will depart on foot again for your walk. Upon returning to the vehicle, you will enjoy sundowners before returning to camp. Back at camp you will enjoy dinner, all the while accompanied by the night sounds of the African bush. However, if guests want to enjoy the ultimate outdoor overnight experience then the Sleep Outs are not to be missed. Sleep Outs is a giant treehouse with sleeping platforms elevated about 4 metres above the ground, each platform has a tent made of fabric that allows you to gaze at the stars from your sleeping bag waking up to the light of the African dawn. Guests are given a lightweight backpack to carry their clothes for 1 night and then leave for Plains with the guides in the late afternoon for a 1-1.5 hour walk arriving at Sleep Outs in the early evening. Guests enjoy sundowners overlooking the waterhole as the guides prepares the fire and traditional South African Braai (barbeque). 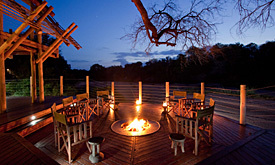 The sounds and senses of the wild at night is an experience unrivalled in the African Bush. While dinner is being prepared on an open fire, enjoy the sounds and senses of the wild, while being safely guarded by our observant guides. After your final morning walk you will return to Plains Camp for a hearty brunch and shower before packing up and being transferred back to Rhino Post Safari Lodge for your final check out. You will be transferred by road to Nelspruit Airport to catch your charter flight to Mazengwenya Airstrip. This is a beautiful, scenic flight over Kruger, Swaziland and northern Zululand. From here you will be transferred in an open 4×4 to Thonga Beach Lodge. Approximately 25 mins driving time on sand roads. On arrival you will be welcomed with a refreshing drink and given a brief orientation of the lodge before being shown to your room. You will have time to relax before enjoying afternoon activity or simply laze on the deck after indulging in a decadent afternoon coffee and cake or treating yourself to a pamper session in the Sea Spa. Join us for a drink at the bar before adjourning to dinner under the stars. 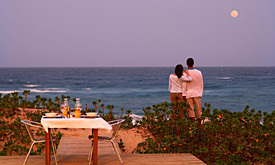 Thonga Beach Lodge is set on the secluded Mabibi Bay, in the heart of the iSimangaliso Wetland Park, an internationally recognized World Heritage Site. With direct access onto the pristine shores of the Maputaland coast, this lodge is the ideal place to discover one of the last unspoilt and undeveloped wilderness beaches left on the African continent. Mabibi is a magical place of tranquil swimming bays and snorkelling reefs, coastal forests, grasslands, bush, shimmering lakes and exquisite sandy beaches. Its clear, warm waters offer superb snorkelling and fantastic offshore SCUBA diving. the cool deck under the Coastal Milkwood trees. Activities at Thonga Beach Lodge include SCUBA diving, Open Ocean experiences, kayaking and sundowners at Lake Sibaya, guided snorkelling, seasonal turtle drives/walks (Nov to Feb), Tsonga Cultural tours and forest walks. Whether a walker or a diver, there are a wealth of activities to explore this beautiful hideaway, or maybe simply relax with a Spa treatment or on the beach deck. SCUBA diving at Mabibi is phenomenal. The professional lodge diving team can accommodate enthusiasts, from the beginner to the veteran. For those who don’t dive, there is an Open Ocean Experience. An exciting launch through the surf in front of the lodge takes guests beyond the breakers to a world of dolphins, whales and snorkelling. The warm Indian Ocean supports a myriad of fish and marine life. Guests can sometimes swim and snorkel with dolphins, whale sharks, Manta rays and giant turtles. In summer there are nocturnal walks and drives along the beach in search of pre-historic turtles laying their eggs. Witness the culmination of an incredible journey as giant Leatherback and Loggerhead turtles come ashore to lay their eggs in carefully prepared nests. Turtle tracking is offered in the evening from November to end of February (The laying takes place from Nov to Jan and hatchlings arrive from end Dec to end February.) Every precaution is taken to ensure these magnificent creatures are not disturbed during the laying process and data collected from the turtle drives is submitted to the Ezemvelo Turtle Monitoring program. After breakfast you will check out of Thonga and be transferred via 4×4 to Coastal Cashews where you will be met by your transfer vehicle for your journey to Richards Bay Airport for your flight back to OR Tambo International, Johannesburg. Flying time 1hr 45 minutes.